The authors of the study weren’t initially on the hunt for a dark matter-free galaxy; instead they had set out to take a closer look at large, ultra-diffuse galaxies. These are similar in size to the spiral galaxies we’re more familiar with, but have a fraction of the number of stars. The galaxy has very few stars, but many of them are grouped together in unusually bright clusters. When the team studied the behaviour of these clusters, they found that the stars seemed to account for all of the galaxy’s mass. Not only was it not directly observed, these Galaxies can’t possibly have any. It sounds as if the astrophysicists need to dump their fudge factor of dark matter and look at what is actually there and how gravity interacts in the galaxy. All this confusion because of Jan Oort’s red-shift dilemma. 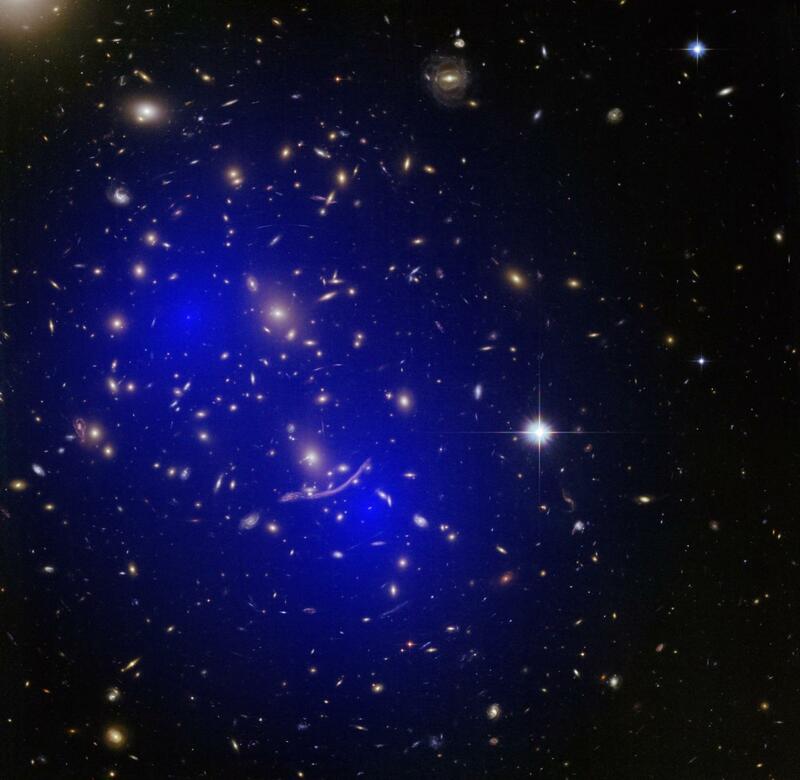 Dark matter is an abstract concept. Not surprising it hasn’t been found in the real universe. “The exception that proves the rule…” No, no no! It is an odd expression that is constantly misused. But it is as it sounds – a stated exception which proves an unstated rule. For example, in a park “ball games allowed on Sundays”. Allowed on Sundays is the exception, the unstated rule is that ball games are not allowed. If astronomers really have found an “undark” galaxy, it’s a strong clue that dark matter is real. Is it? Sounds like wishful thinking to me. I find it obvious that if a rational person believes that the observation above shows that dark matter and visible matter may separate by the distance comparable to the galactic radius, they may sometimes get separated even more than that, and then they have enough velocity to escape from each other. If that’s so, there should be galaxies that contain only visible matter – and those that only include dark matter (but the latter are harder to see because everything is dark in them). Again this sounds like holding on to a theory for lack of a better one to turn to. A Galaxy that has little Mater seems to have little Dark Mater, well DUH ! The mass/inertia evident is caused by the tension caused by the Mater involved. It is an interesting paper. The observed velocity dispersion is sigma_obs = 8.4 km s−1,as measured with the biweight estimator (see Methods). This value is much smaller than that in previously studied (cluster) UDGs, and not much higher than the expectation from observational errors alone. Taking the errors into account, we find an intrinsic dispersion of sigma_intr = 3.2(+5.5 −3.2) km s−1. The 90% confidence upper limit is sigma_intr < 10.5 km s−1. The average velocity dispersion of Local Group galaxies with 8.0 ≤ log(M/M_sol) ≤ 8.6 is 32 km s−1 (dotted curve in Fig. 3a). For a MOND acceleration scale of a0 = 3.7 x 10^3 km2 s−2 kpc−1 the expected velocity dispersion of NGC1052–DF2 is sigma_M ~ (0.05*G*M_stars*a_0)^1/4 ~ 20 km s−1, a factor of two higher than the 90% upper limit on the observed dispersion. So MOND had the better prediction, yet is less supported by this data according to them. The image looks like two galaxies destroyed each-other sometime in the past. Maybe it was two black-holes of equal size that collided, causing mutual annihilation into visible matter leaving no super dense matter around.